In the 2016 edition of the Journal Bibliometric Report (JBR), CEON/CEES has introduced, among other innovations, two new impact indicators: CEON WoS Impact Factor 2 and CEON WoS Impact Factor 5 . The new indicators are calculated and displayed for all journals indexed in SCIndeks. For the journals indexed in the Web of Science (WoS), the values of these indicators are taken from the Journal Citation Reports (JCR). For the other journals, they are calculated based on citations found in the Web of Science and the number of papers published in SCIndeks journals over the past two/five years. CEON WoS Impact Factor 2 and CEON WoS Impact Factor 5 are calculated according to the same formula as the corresponding indicators in JCR, due to which they are fully compatible with the 'official' Impact Factor published by the JCR. However, it should be highlighted that the compatibility applies only to the JCR Impact Factor without Journal Self Cites. It is a well-known fact that the citations of journal articles are tracked by WoS, both for WoS-indexed journals and those not indexed in this database. The only difference is that in the latter case, citations cannot be linked with the cited papers (as they are not available in WoS), which would ensure a greater accuracy of citation counts. However, though the citations from the non-WoS-indexed journals may be incorrect, primarily due to incorrectly cited journal titles, they can still be counted. Moreover, they can be accurately identified if the user knows all versions of the tracked journal’s title (abbreviated, commonly used, etc. In order to ensure that WoS citations for Serbian journals are accurately counted when preparing the JBR, over the years, CEON/CEES has compiled a database of alternative titles of Serbian journals used in citations. Thanks to this, as well as to a special algorithm relying on the colation of the cited papers, we manage to count the WoS citations of SCIndeks journals very accurately. The journals do not have such a database and they are often unable to identify all of their citations. This is probably the reason why the new journal bibliometric report for 2016 prepared by the Mathematical Institute of SASA for the Ministry of Education, Science and Technological Development contains numerous errors, which in some cases affect considerably journal rankings. 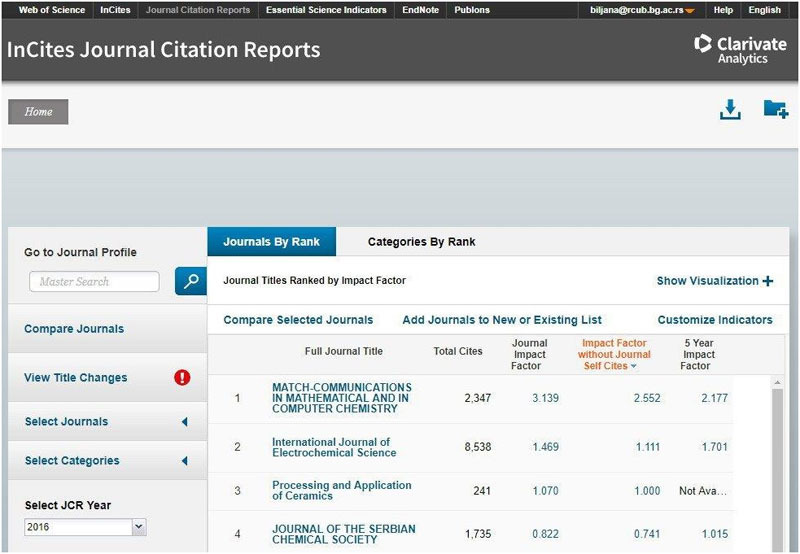 The underrated journals can easily be identified by comparing the citation counts in this report and those provided in the CEON/CEES JBR. The main purpose of the new indicators is to enable journals aspiring to merit inclusion in WoS to compare their performance with other journals in relevant subject areas already indexed in this database. A too low CEON WoS IF compared to the lowest-ranking journals in a relevant subject area should be a sufficient reason for the editorial board to postpone the application until the citation counts in WoS are improved. Conversely, fairly high IFs have been successfully used by some Serbian journals to support their WoS applications. It is also advisable to use this argument when applying for indexing in Scopus or other, subject-based bibliographic databases. The CEON WoS IF has in important role in the CEON/CEES JBR, where it is used when assigning journals to the category National Journal of International Significance (M24). The IF calculated using this methodology is referred to in the literature as the ‘unofficial IF’, as opposed to the ‘legitimate IF’, or the ‘official IF’ published by in the Journal Citation Reports . The unofficial IF is unjustifiably identified with ‘fake IFs’, produced by a growing number of false evaluators. Impact factors are sometimes calculated by journal editorial boards and published on journal pages with the aim of gaining authors’ trust. However, this practice is not perceived as appropriate and trustworthy due to the apparent conflict of interest. WoS citations are counted with an even greater accuracy than in JCR thanks to the described procedure, which enables CEON/CEES to identify the citations beyond the radar of JCR analysts. For all these reasons, CEON WoS IF is displayed not only in JBR but also in SCIndeks. It is also recommended to journals to display it on their pages, always accompanied with a note saying that the indicator is calculated by CEON/CEES, as a data aggregator and an independent evaluation agency. When displaying this indicator, it is advisable to accompany it with the SCIndeks IF, which is calculated based on the sum of citations in SCIndeks and WoS, where the WoS citations are weighted according to a special formula. Presenting both indicators is an equally legitimate way of promoting a journal. CEON/CEES by no means considers this a mandatory practice and it is up to journal editorial boards to decide whether this type of information improves the desired public image of the journals. CEON/CEES. (2003-2016) Pomoć: Pokazatelji uticajnosti, Bibliometrijski izveštaj o časopisima, preuzeto sa: http://bic.ceon.rs/ [accessed 24 January 2018].